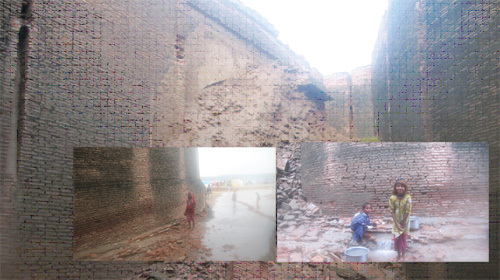 The heavy rains in the province have taken their toll on the historical 200-year-old Talpur-era Naukot Fort as a large portion of its boundary wall and some parts of its main gate’s arch collapsed on Sunday afternoon. Beside that the roof of a small tunnel-shaped room at the main entrance also caved, closing the only entrance to this Talpur-era bastion. Around 64 kilometres south of the divisional headquarter city of Mirpurkhas, the Naukot Fort is a symbol of the Talpur-era architecture. Built with bricks mixed with mud and limestone, the fort is unique in style in the sense that no wood and iron is used in its construction, even in the roofs. Commonly known as the gateway to Thar Desert, the Naukot Fort is located on the border of the barrage area. The fort is divided into three main portions including the residential area, the barracks and a huge ground, where it is said that the rulers held darbars or public gatherings. Archeologists believe that the Talpur rulers used the Naukot Fort as the centre for collecting tax on agriculture or ‘dhal’. The provincial Archeology Department’s official record reveals that Mir Karan Ali Khan Talpur built the fort in 1814. After breaches developed in the rain-swollen Left Bank Outfall Drain, Puran canal and other drains in the area, water started flowing like a river in Naukot town and according to locals, the main ground of the fort is also inundated. “The fort ground is full of rainwater and continuous rains had already damaged the fort, now a major portion of it collapsed with a loud sound, panicking the families living outside it,” said Association for Water, Applied Education and Renewable Energy (AWARE) Umerkot Programme Officer Jan Muhammad Samoo. He said that there were many families living inside the fort, who are finding it difficult to come out as the only entrance closed after the main gate arch has collapsed. The Talpur rulers had also built several forts in the Thar desert. Some of them include Islamkot, Singaro and Mithi forts, but none of them are as prominent as the one in Naukot. Officially, 130 heritage sites are protected in Sindh under the Sindh Antiquities Act; however, there are hundreds of others. The recent rains have badly affected some of these sites and a large number of rain-affected families have taken shelter in many of them after their native areas became submerged. Unfortunately, the Sindh Culture Department – the official custodian of these sites – has not bothered to take any action for their preservation. Provincial Culture Minister, Sassui Palijo said that she is not aware that the main gate of the historical fort has collapsed. Despite being the culture minister, she is busy in the rain-hit areas of Thatta district – her constituency – doing relief work, which is actually the responsibility of the National Disaster Management Authority, Provincial Disaster Management Authority and district governments. Being the official custodian of heritage sites, it is the responsibility of the provincial Culture Department to look after the rain-affected heritage sites. The minister also told Pakistan Today that she would soon arrange a national conference on finding out the possible ways to protect the ancient city of Moenjo Daro even though her focus should be on the heritage sites affected by rains. “I have submitted a summary to the chief minister asking of Rs 200 million for the protection of Moenjo Daro,” said Palijo. But when asked about the hundreds of other sites, she said that her department would mull over that. She said that are some families in Jhirk town of Thatta district who stranded after rainwater accumulated their village, so she is busy searching tents and food item for them. Other historical sites in lower Sindh irreversibly damaged in the rains include Roopa Mari, Hindu and Jain temples in the Nangarparkar area of Tharparkar and Umerkot Fort.